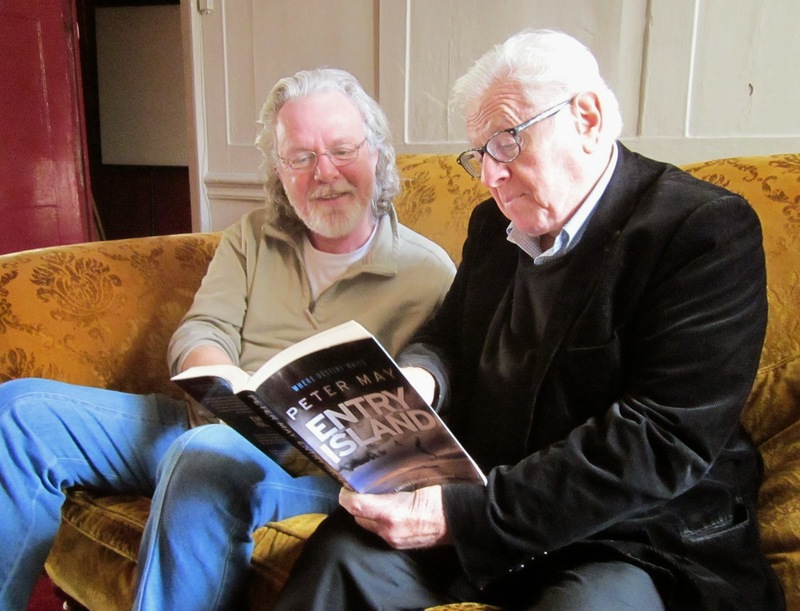 Author Peter May (left) looks over a copy of Entry Island with London Times critic Marcel Berlins. Most of The Rap Sheet’s American readers probably know Scottish author Peter May best because of the success of his novel The Blackhouse, which was finally released last year in the States--a year later than in Great Britain--and wound up on a number of “best books” lists for 2012 (including this one by Rap Sheet editor and Kirkus Reviews columnist J. Kingston Pierce). 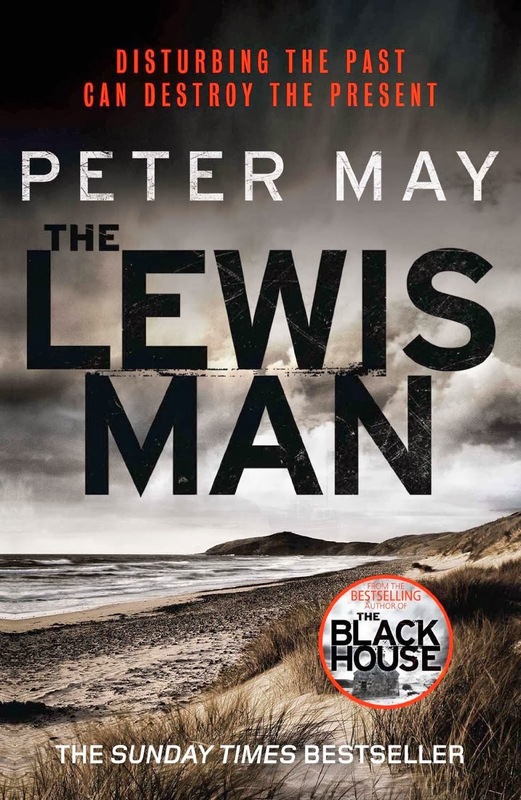 However, The Blackhouse was just the opening installment in May’s Lewis Trilogy, set in the rugged Outer Hebrides islands off the west coast of Scotland and starring onetime Edinburgh police detective Fin Macleod. 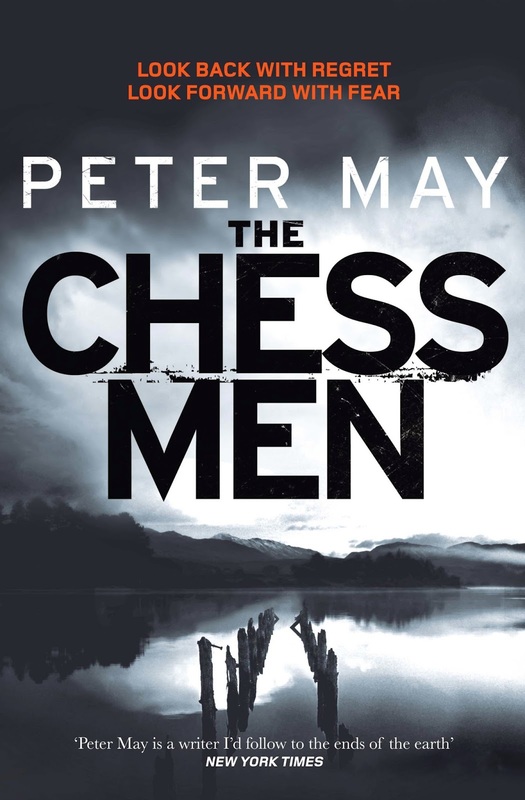 The subsequent two books are 2012’s The Lewis Man and 2013’s The Chessmen (neither of which is yet available in a U.S. edition). When Detective Sime Mackenzie boards a light aircraft at Montreal’s St. Hubert airfield, he does so without looking back. For Sime, the 850-mile journey ahead represents an opportunity to escape the bitter blend of loneliness and regret that has come to characterize his life in the city. Traveling as part of an eight-officer investigation team, Sime’s destination lies in the Gulf of St. Lawrence. Only two kilometers wide and three long, Entry Island is home to a population of around 130 inhabitants--the wealthiest of which has just been discovered murdered in his home. The investigation itself appears little more than a formality. The evidence points to a crime of passion: the victim’s wife the vengeful culprit. But for Sime the investigation is turned on its head when he comes face to face with the prime suspect, and is convinced that he knows her--even though they have never met. Haunted by this certainty, his insomnia becomes punctuated by dreams of a distant past on a Scottish island 3,000 miles away. Dreams in which the widow plays a leading role. Sime’s conviction becomes an obsession. And in spite of mounting evidence of her guilt he finds himself convinced of her innocence, leading to a conflict between the professional duty he must fulfill, and the personal destiny that awaits him. Due to high anticipation of Entry Island’s release, its UK publisher, Quercus, recently invited several literary critics and booksellers out to lunch in London, giving them access to the 62-year-old author as well as a sneak peak at the journey his new tale offers readers. As The Rap Sheet’s British correspondent, I was asked to join the festivities. 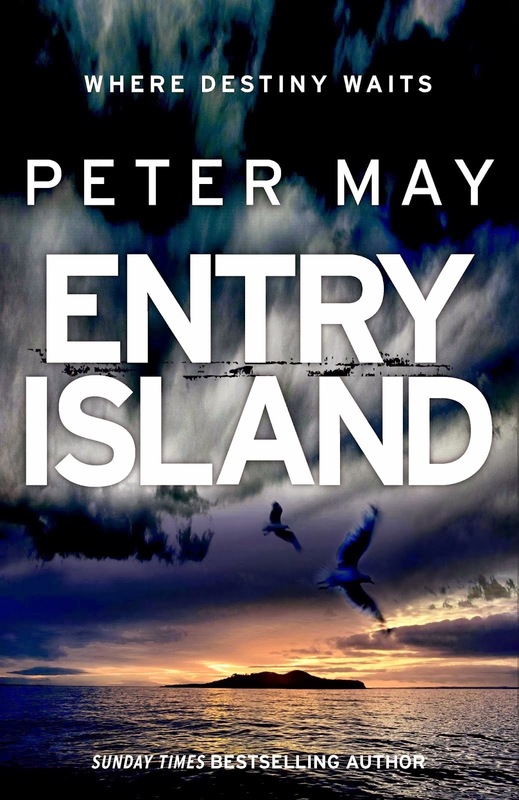 It gave me the chance not only to speak at some length with Peter May, but also to ask him to submit an essay to this blog about the research he did in preparation for penning Entry Island; that essay will be posted here tomorrow. It will be followed on Saturday by details of a contest whereby Rap Sheet readers can win free copies of May’s work. Let’s begin, however, with a little background on the author. Born in Glasgow, Scotland, in 1951, May pursued a career path initially in journalism, writing for The Scotsman and the Glasgow Evening Times. He saw his first novel, The Reporter, published in 1978, when he was a tender 26 years old. That success led to May being asked to adapt his novel for television; it became a 13-part prime-time BBC Scotland series titled The Standard, about efforts to reverse the commercial decline of a Scottish newspaper. He went on to create two other “major” small-screen dramas, Squadron (1982) and Machair (a 1992-1998 soap opera). According to his Web site’s biography page, May was eventually recognized as “one of Scotland’s most prolific television dramatists, [garnering] more than 1,000 credits in 15 years as scriptwriter and script editor on prime-time British television drama.” But then in the mid-’90s he quit television in favor of full-time book writing. Prior to embarking on the Lewis Trilogy, he won praise for two other series: his China Thrillers, featuring Beijing detective Li Yan and American forensic pathologist Margaret Campbell; and the France-set Enzo Files, which brought us Scottish forensic scientist Enzo MacLeod. May currently lives in France, a country that has been especially enthusiastic in its embrace of his storytelling, presenting him with an assortment of commendations, including (in 2011) the prestigious Cezam Prix Littéraire Inter CE. 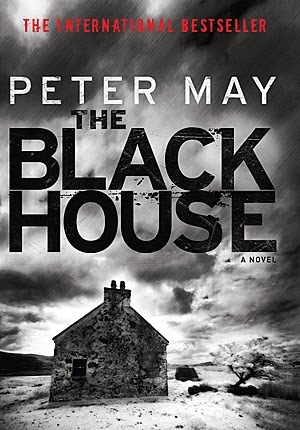 Adding to his collection of prizes, during last year’s Bouchercon in Albany, New York, The Blackhouse won May the Barry Award for Best Novel from Deadly Pleasures Mystery Magazine. That same book was chosen as one of Britain’s Richard and Judy Book Club picks in 2011. Over the course of my recent conversation with Peter May, we discussed his enthusiasm for travel, his coming book tour, the reissuing of his earlier novels in e-book format, the genesis of Entry Island, and much more. The results of that exchange are below. Ali Karim: After winning acclaim for The Blackhouse and your other entries in the Lewis Trilogy, what prompted you to again use an island backdrop for Entry Island? Peter May: The island setting was coincidental, really. It was always my intention to return to the Hebrides for this book, since there were some classic examples of land clearances on the islands that I could use as the basis for my story--and it was [Scotland’s] Highland Clearances that were the inspiration for the book. But the use of [Quebec’s] Magdalen Islands came about because my neighbor in France was born and raised there. So I had seen photographs, and been struck by the similarities with the Hebrides. The decision to use them as a setting was sealed when research revealed the presence of a small community of English-speakers on the smallest island in the archipelago--Entry Island--many of whom were descendants of Scots exiles. Many of the people forcibly cleared from their land in the Highlands of Scotland during the 18th and 19th centuries ended up in Canada after being forced on to boats. So Canada was a natural setting for the contemporary, crime element of my story, leaving the Hebrides as the setting for the historical. Originally, I had planned to use Nova Scotia and Prince Edward Island as the Canadian settings, but an e-mail I received from a lady Presbyterian minister who was descended from Hebridean settlers and raised in the Eastern Townships of Quebec, led me to Quebec as the setting--and therefore the Magdalen Islands, which are a part of that province. AK: Your interest in distant settings for your fiction no doubt stems from your enthusiasm for travel. But from what does that travel interest spring? PM: I am naturally restless. If I have been in one place too long, I start to get itchy feet. In Scotland I had lived in Glasgow, Edinburgh, Ayrshire, Argyll, and the Hebrides. I was led to China as a setting for my crime thrillers after a chance one-day visit when I was researching another story in Hong Kong. I then spent nearly 10 years traveling back and forth to China to research my China Thrillers. France was a logical move from Scotland when my feet got itchy again, because I had been going to France almost every year for 30 years and already owned a holiday home there. But I think it is fair to say that I would probably never have written the Lewis Trilogy had I not moved to France. It was only that distance and perspective that gave me the urge to write about my home country. Now, of course, I winter in Spain. But I think I just naturally gravitate further south in search of the sun as I get older. AK: We hear you will be touring with Entry Island. Can you tell us a little about that tour? And have you had any funny experiences while on the road promoting your previous books? PM: The tour kicks off with several radio interviews in London early in January, followed by a sequence of launch events and signings in Aberdeen, Inverness, Glasgow, and Edinburgh. I then head off to Dublin and end up in London on January 21st for an event at Waterstones, Picadilly. I head across the Channel after that for an event at W.H. Smith’s in Paris, followed by four events at Paris bookstores, before finally resuming my winter exile in Spain. I always seem to have travel disasters when on the road--train derailments, planes going on fire, air traffic strikes, blazes on motorways. I am usually tweeting as I travel, and my followers are now so used to my disasters that every time there is an adverse travel story on the news, people tweet to ask if I am on the road again. But my biggest traveling disaster was on my first book tour of the U.S., when I decided to travel wearing my kilt rather than pack it--a) for fear of losing it because it was so expensive, and b) to stop it getting hopelessly crushed. BIG mistake! I got stopped every time going through airport security and had to stand (usually with a large crowd of curious Americans watching), while some smirking security man took delight in waving his detector wand up my kilt. As if that wasn’t bad enough, those security booths that fire jets of air at you from every direction somehow managed to fill my kilt with air and lift it up to my waist to reveal definitively what a Scotsman wears beneath it. I felt like Marilyn Monroe. 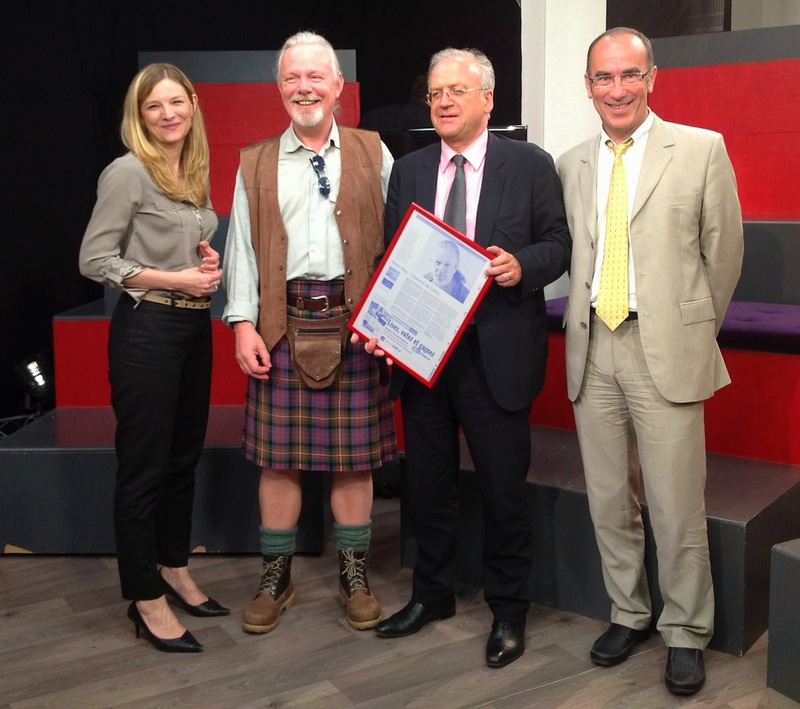 Peter May--yes, the chap in the kilt!--winning Le Télégramme Readers’ Prize in Brest, France, in May 2012. AK: You have often mentioned that it was your French publisher that got The Blackhouse into print first, and then it achieved international renown. Why is it that the French saw the (obvious) merit in your dark tale, after other publishers had turned down the manuscript? PM: I think The Blackhouse was perhaps a little ahead of its time in terms of its tone and setting. It was first doing the rounds of UK publishers in 2005, just before the major invasion of Scandinavian crime writers with their dark, psychological novels set in cold northern places. While the British publishing industry was slow to realize that there was a huge potential market for this kind of book among British readers, the French already had their own genre for it--the “roman noir” or, literally, the black novel. The Blackhouse fitted neatly into that genre and so found a natural home in France. AK: During last year’s Bouchercon in New York state, you gave a very amusing and moving acceptance speech after receiving Deadly Pleasures’ Barry Award for Best Novel. [Watch that speech here.] But what else did you got up to while in Albany? PM: Bouchercon is one of the great crime-writing conventions, where not only do you get the chance to meet and talk to many of your readers, but you also have the opportunity to mix with booksellers and other writers and chew the crime cud together. So I spent most of my time drinking, eating, and talking--and, of course, listening to other writers at many of the panels that were held across the weekend. AK: Your mantelpiece must be rather crowded, what with all the awards you have received over the years for your writing. Which among those commendations, though, are particularly special to you? PM: The first award I ever received was for the Scottish Young Journalist of the Year in 1973. I was just 21, and so that has a very special place in my memory. My first award in France was also special--since it was voted for by panels of prisoners in French penitentiaries. The book that won it was Snakehead , one of the China Thrillers, and I beat off competition from six French writers to win. But in accepting the nomination I had to agree to visit several prisons and talk to prisoners about books and literature. That was a fascinating, salutary, and sometimes depressing experience. The Lewis books have won six literary prizes among them in France, but the ones that stick in my mind were those awarded by the Le Havre crime festival. The books of all the invited writers are voted on by readers at more than 20 libraries around Le Havre. You are only invited back the following year if you have won the prize that year. After The Blackhouse and The Lewis Man had both carried off the prizes in successive years, the organizers were obliged to ask me back for a third time. But they asked if The Chessmen could be excluded from the nominations, because the French writers were getting fed up with me winning all the time. I didn’t go that summer, but was pleased when The Chessmen won the Prix International at that year’s Cognac festival. AK: Please tell us about your book of photographs and history, Hebrides (released last fall), as it’s a wonderful companion to the Lewis Trology? 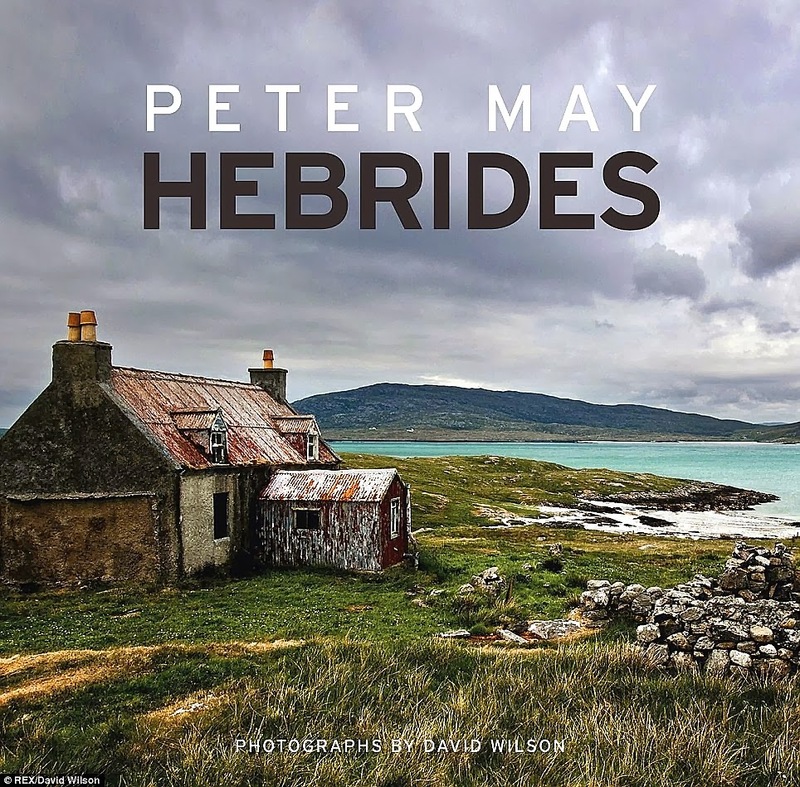 PM: While touring France and the UK to promote the Lewis books, readers kept saying to me how much they wanted to visit the Hebrides after reading the books. Some, in fact, made the journey--at one event in France, readers presented me with a vial of sand taken from a beach on the Isle of Lewis. So when Quercus suggested a photo companion book for the trilogy, it seemed an absolutely natural thing to do--providing readers with the chance to see the islands for themselves without having to make an expensive trip, and giving me the opportunity to talk about the genesis of the series. My old friend, TV production designer David Wilson, with whom I had worked in television drama, was now living on the Isle of Lewis, and being an accomplished photographer was the natural choice to take the photographs. And a wonderful job he did, too. AK: We’ve heard that Quercus is bringing some of your backlist into print once more. Have you any details about which books will be reissued, and in what formats? PM: The entire China Thrillers series is now available on Kindle in the UK, and will at some point be re-issued in paperback. Equally, the Enzo Files are also available as e-books in the UK, and the first of them [2006’s Extraordinary People] will, I believe, be issued in paperback for the first time in Britain sometime next year. [The 2010 standalone] Virtually Dead will also appear in the near future as an e-book and in paperback (but, again, you’ll need to ask Quercus for details). I have still to write the final book in the Enzo series. AK: So fill us in a bit on the genesis of Entry Island. PM: Entry Island fulfilled a long-held ambition to write something about the Highland Clearances. But not wanting to write a purely historical novel, I had to find a contemporary story and setting that would somehow link to the past. As I explained earlier, for the contemporary setting I chose the Magdalen Islands in Quebec, Canada--a group of islands in the middle of the Gulf of St. Lawrence, and similar in many ways to the Hebrides. And not wanting to let go of the Hebrides themselves, the Isle of Lewis and Harris is where the historical element of the book finds context. What makes the link between the two, of course, are those poor souls evicted from their homes and forced aboard ships for the New World. And while it is always sad to say good-bye to characters like Fin and Marsaili, who became like old friends in the Lewis Trilogy, it is always exciting to meet and get to know new ones. In this case Sime Mackenzie, a Montreal homicide detective whose family hailed from the Hebrides generations earlier. With Entry Island I wanted to push the boundaries of the crime genre, which seems to me to have infinite possibilities. AK: Are you surprised that very few people outside of Scotland and Canada are familiar with the Highland Clearances? And what sorts of research did you do into that tragic chapter from Scotland’s past while working on Entry Island? PM: I am not surprised that so few people know anything about the Highland Clearances. In truth, many people in Scotland today are also ignorant of this shameful piece of British history. Even although I took Higher history at school, I knew nothing about the Clearances until I was an adult. It simply wasn’t on the curriculum. It was John McGrath’s wonderful 1970s theater piece, The Cheviot, the Stag, and the Black Black Oil, that first drew it to my attention. I have often wondered why it wasn’t taught to kids at school. But perhaps, given the brutal nature of what was effectively a 100-year exercise in ethnic cleansing, the powers-that-be preferred to push it under the carpet of history. I wanted to lift that carpet, and take a fresh look at it through the medium of fiction, and perhaps bring it to the attention of the wider audience it deserves. I did a huge amount of research reading on the history of the Clearances, as well as life in the Hebrides in the mid-19th century. And, of course, I made trips back to the Hebrides to visit the remains of cleared villages on the west coast of Lewis and Harris, and to select the locations I would use for the book. As well as going to the Magdalen Islands, my research took me to the Eastern Townships of Quebec, which were established by Scots evicted by brute force and coercion during the Clearances--many of whom came from the Hebrides. I visited the towns of Stornoway and Tolsta, where the cemeteries were full of Macleods and Macritichies and Macaulies and many others, from the Isle of Lewis and Harris. One village described itself as the “Hebridean township of Gould,” and there was an inscription on its cemetery gates dedicated to the people of the Isle of Lewis. I found it a profoundly moving experience, and it reinforced the whole point of Entry Island for me--that “the blood is strong,” and that without the courage and fortitude of those poor people forced from their homes and on to boats, the generations that followed would not have had the gift of life. An old lady of 93, whom I met in Lennoxville, still spoke Gaelic. Her forebears hailed from Back and Tosta on the Isle of Lewis, and she talked emotionally about the pride she felt in her ancestors, who against all the odds had survived and prospered to give that gift of life to her and all those who followed. Here is a link to a short slideshow taken in Stornoway, Quebec, that I put together on my iPad and posted on YouTube while I was out there for my research, and here is one of Entry Island itself. AK: Do you miss your former life in journalism and TV/film production? Or is writing full-time enough for you these days? PM: I only ever wanted to write books, from the earliest age. My careers in journalism and then as a TV scriptwriter and producer were only ever the prelude to the career as a novelist I had always sought. As anybody who has ever tried to make a living from writing books will tell you, it ain’t easy. And it hasn’t been. But I’ve survived, and the books are now achieving a level of success that I could only have dreamed of a few years ago. So, no, I don’t miss those previous incarnations, but without them I probably wouldn’t have been the writer I am today. AK: We understand that The Blackhouse was originally supposed to be a standalone novel, and that you were persuaded it had legs enough to support a trilogy. At this early stage, do you see the same thing happening for Entry Island? PM: Definitely not. I was aware, even as I was developing the embryonic idea for Entry Island, that it could only ever be a standalone. And knowing that, of course, publishers always prefer a series, I went to my editor with some trepidation to say that the idea for my next book would only produce a one-off. To my delight, when he read my synopsis, he was 100-percent supportive, and so I set about writing [Entry Island] without the concern of whether or not it would have “legs” beyond that one story. AK: And what are working on now? PM: I am working on a story that has been brewing in my imagination for some years. It is based on a real event from my own life, when I was a teenager, and the story is told in two timelines 50 years apart, involving the same group of characters. AK: Finally, why do you think that--outside of young adult fiction and children’s fiction--crime fiction is today’s No. 1 bestselling genre? PM: I think that crime, given its broad definition and almost endless possibilities, offers the writer the opportunity to take readers into virtually any situation, in any setting, and explore the effects of putting ordinary people under extraordinary pressure. More than any genre outside the novel itself, it provides both writer and reader the chance to examine, and often identify with, the human condition in its broadest sense. Coming tomorrow: Peter May reports on some of the research he conducted in order to compose Entry Island.